What in the world happened to Elisha Hughes? 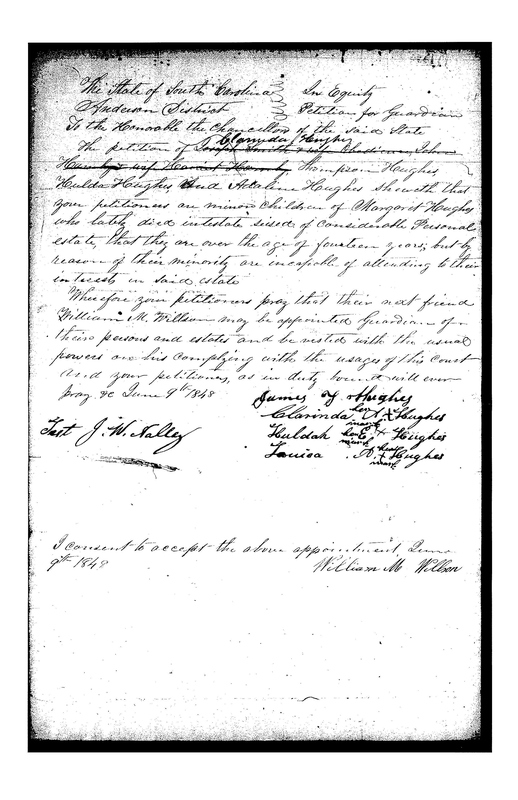 This petition, dated June 9th, 1848, seeks guardianship of the orphans of Elisha and Margaret Hughes for Margaret’s brother, William M. Willson. Nation, I need your help to solve a mystery that’s more than 174 years old. One of the great unsolved mysteries in my Hughes line is this: What in the world happened to my 3rd great grandather, Elisha Hughes? The facts of his life, as I currently know them, are fairly sparse. He was born about 1800 (exact date unknown) in the old Pendleton District of South Carolina. His parents were Andrew Hughes (1755-1843) and Obedience Sumner (1765-1829). Sometimes I have seen his name written as Elisha “Lish” Hughes, and sometimes his middle name is given as “Mattison” or “Madison.” But I have not seen any evidence myself that proves beyond doubt he had any names other than Elisha Hughes. By 1820, Elisha had married Margaret “Peggy” Willson and his household of two was listed in the 1820 U.S. Census for Pendleton, S.C. But by 1830, Elisha and Peggy were living in Habersham County, Ga. They had eight children together, including my great-great grandfather, James Thompson “Thomps” Hughes (1831-1919). But by 1839, Elisha had disappeared, and no one seems to know for sure what happened to him. Some have speculated that he may have abandoned his family and traveled west. Others have speculated that he may have died while participating in “Indian removal” from Georgia. The one thing that no one has offered, in what I have read about him so far, is an explanation for his disappearance that’s backed up by evidence. We know what happened to Peggy — she died sometime before June 1848. We know what happened to the children who were left orphaned when Peggy died — custody of the orphans was awarded to Peggy’s brother in Anderson, S.C. in June 1848, and by 1850 they were living in Pickens County, Ala. We know where both Thomps Hughes and his younger brother, William McMurray Hughes, are buried. But we still don’t know what happened to Elisha. However, I’m willing to bet that someone out there has evidence in hand that may help me answer that question. With that in mind, it’s time to put crowdsourcing to work for me. Do you know what happened to “my” Elisha Hughes? If so, I’d love to hear from you. Email me at tahughesnc@gmail.com.